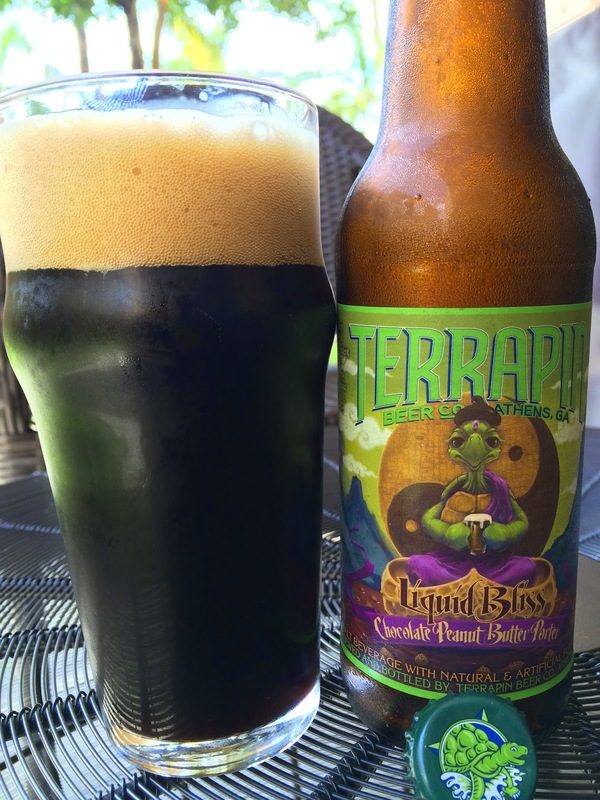 You probably remember Terrapin Beer's Andy Rattner telling me on ByTheGlassShow about their Liquid Bliss Chocolate Peanut Butter Porter, originally Side Project Volume 18, becoming one of their newest year round beers. Right? Well, I saw it on the shelf at Total Wine a few days ago for the first time. 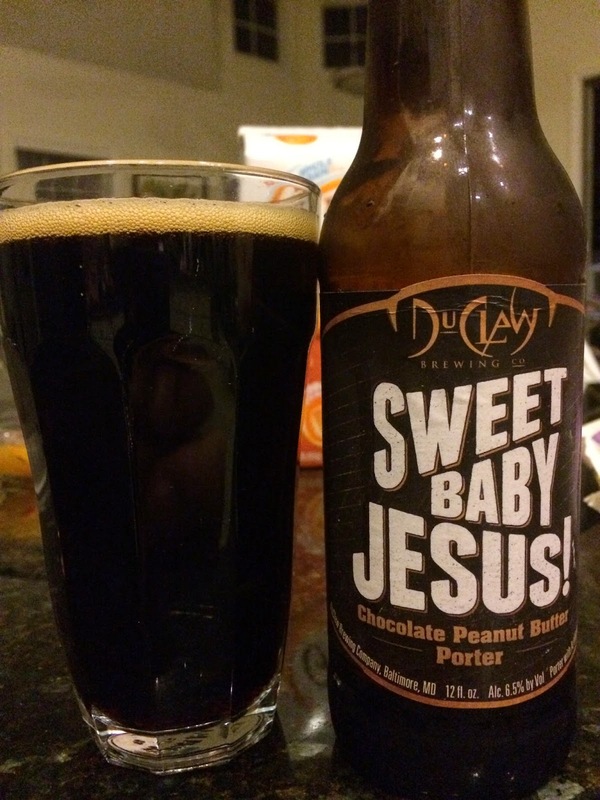 It was kind of funny since I can't remember ever trying a beer like this, but I recently also tried a six pack of DuClaw Brewing's Sweet Baby Jesus Chocolate Peanut Butter Porter (no review so here's BA) while vacationing in New Jersey. 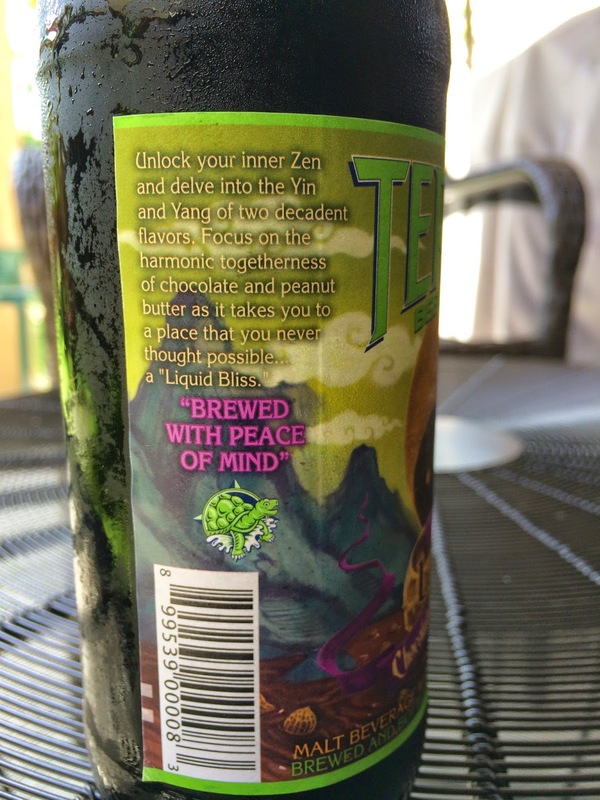 There's a Swami turtle meditating over his glass of beer while a Yin-Yang Gong sits behind him. A little story sets your expectations, but know this was "Brewed With Peace Of Mind." Best if enjoyed by the first week of February, 2015. 6.1% alcohol. Huge Peanut Butter aroma, and I eat a lot so you need to believe that as fact! Fresh roasted peanuts and second-fiddle cocoa are also aroma nuances (I'm pretty sure fiddles are big in Athens too, no?) The aroma is make-out-with-it fabulous! Flavors start with cocoa and some roasted malt. The peanut butter is there but seems really watered down. Smooth texture but feels pretty flat on the palate. The bold chocolate and peanut butter flavors you are begging for (based on your knowledge of Reese's Peanut Butter Cups) do not translate in this beer. Instead, all the flavors seem to blend into one weird meh flavor. The aroma >>> flavor, and weird flatness things are exactly what happened with my Sweet Baby Jesus beers too, and my entire family agreed. I did get my Sunday School Teacher mom to laugh about the name though. And I will say that Liquid Bliss' aroma destroyed DuClaw's version. And though the beer was okay and I did drink the entire bottle, I'd have left this on the Side Project History Shelf. Fun experiment though.